We were recently awarded the Calzona Prize in a ceremony at UCSD. The award includes the deed to a plot of land in the desert on the border of California and Arizona, which we will use to create art and turn the land into a way-station for travelers. The artwork will be a series of earthworks that relate to the formation of the Salton Sea. 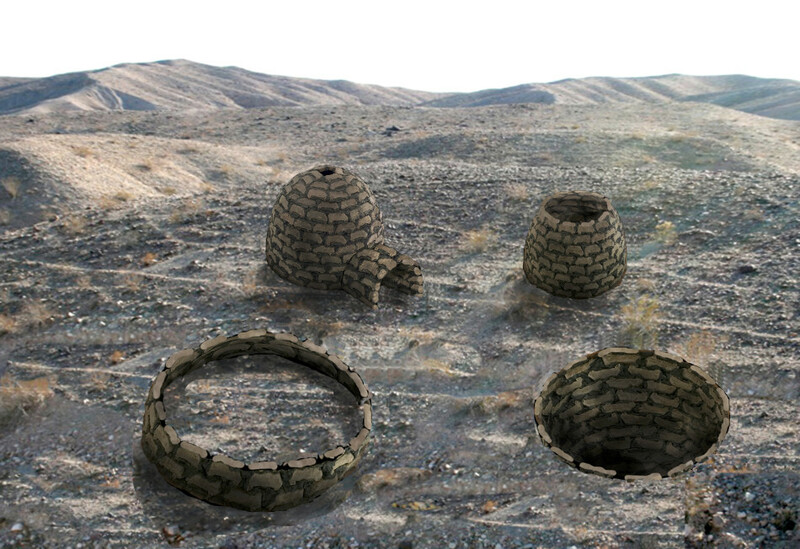 This project should take about a year to complete and will be a sister piece to Earth Igloo for Jerusalem, a piece we created for an exhibition at Museum on the Seam. Calzona is a sub-development near the Colorado River, a perfect location for Igloo Inversions for the Salton Sea, a monument to the 1905 breach of the river that led to the creation of the Salton Sea. The work will consist of a several structures made of adobe extracted from the site at Big River and from the Salton Sea, complete with barnacles and bones of tilapia. What you see here is our artist’s rendering of a work in progress. The largest structure will be in the form of an igloo. The sister to this convex dome will be a concave depression in the ground (a mirror image of the Dome) made with the same techniques. Two additional structures will show a transition from convex to concave. Each structure serves different purposes and focuses on different aspects of the environment. The closed dome is a shelter, a means of “conquering” the environment and disconnecting from nature. An open topped dome becomes an observatory, bringing our attention to the skies above and forcing us to contemplate the vastness of the universe. 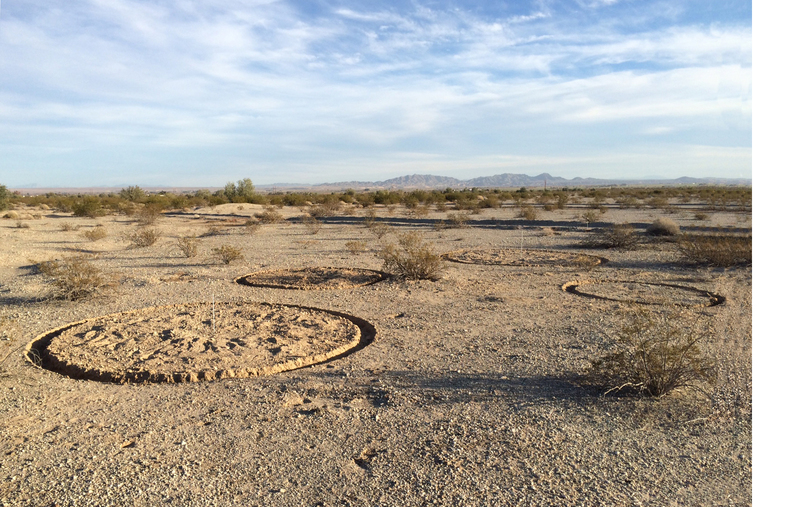 A low ring becomes a wall, highlighting our human propensity for marking off territory. The concave depression could potentially hold water or plantings that return our focus to the earth. 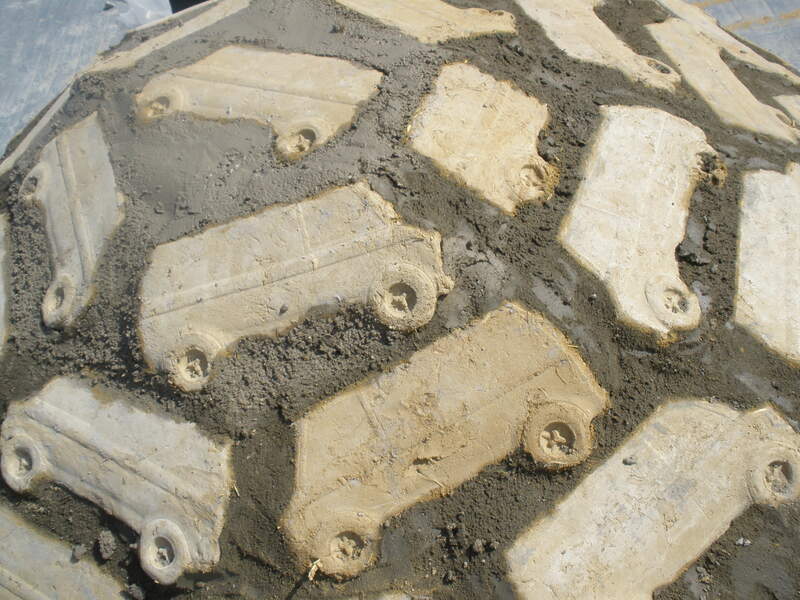 The structures will be a combination of SuperAdobe and mud bricks molded into the form of 1970’s gas-guzzling vans. Once symbols of freedom and American affluence, these vehicles have become icons of waste. The resulting structures will reflect both the versatility of the earth, and the effects of human habitation, particularly our role in global warming through CO2 emissions. Adobe building is among the most ancient of architectural techniques and one of the earliest visible signs of humans exploiting and manipulating their environment. August 30, 2017 | Filed under Projects and Works and tagged with adobe architecture, Calzona Prize, Ecological art, enbvironmental art, superadobe.